On the evidence of the authors of Advances in Project Management: Narrated Journeys in Unchartered Territory, there is a sea change coming. That change will affect the way projects are perceived, lead and governed, particularly in the context of the wider organisation to which they belong; whether that is in the public, private or not-for-profit sectors. Many organisations have struggled to apply the traditional models of project management to their new projects in the global environment. Anecdotal and evidence-based research confirms that projects continue to fail at an alarming rate. A major part of the build-up to failure is often the lack of adequate project management knowledge and experience. Advances in Project Management covers key areas of improvement in understanding and project capability further up the management chain; amongst strategy and senior decision makers and amongst professional project and programme managers. This collection, drawn from some of the world’s leading practitioners and researchers and compiled by Professor Darren Dalcher of the National Centre for Project Management, provides those people and organisations who are involved with the developments in project management with the kind of structured information, new approaches and novel perspectives that will inform their thinking and their practice and improve their decisions. Darren Dalcher is the founder and Director of National Centre for Project Management. He has built a reputation as leader and innovator in the area of practice-based education and reflection in project management and has worked with many major industrial, commercial and charitable organisations and government bodies. He is active in numerous international committees, standards bodies, steering groups, and editorial boards and heavily involved in organising international conferences, and has delivered many international keynote addresses and tutorials. He has written over 200 refereed papers and book chapters on project management and software engineering. 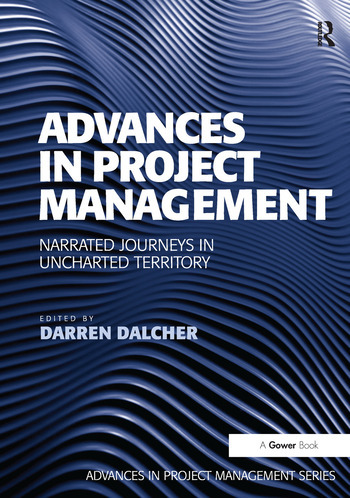 Professor Dalcher is the editor of the two book series Advances in Project Management and Fundamentals of Project Management. He was named by the APM as an influential expert in project management for his contribution in ’integrating and weaving academic work with practice’ and awarded a prestigious Honorary Fellowship for outstanding contribution to project management.